The current topic for ASQ Influential Voices to address is the importance of the education system and the impact on the capability of employees. The education system is important and not very good in my opinion. As a kid I found it boring and constraining and a system designed more to extinguish my quest for knowledge than increase my desire to learn. As a kid I was told by adults that adults knew better and I shouldn’t complain. I was told “don’t you realize you are in one of the best school systems in the USA?” With a bit of data I was convinced that seemed likely. To me this seemed like an even more ominous sign. If the best was this bad what was everything else like? The argument that made the most sense to me (for why I should be happy with, or at least accept, the lousy system I was stuck in) was that as a kid I probably just didn’t understand why this environment that seemed to bore not just me, but most all the kids around me and this system that crushed our desire to learn must somehow be working otherwise the adults would certainly fix it. As an adult what I find is my thoughts as a kid were essentially completely correct (except that last one that adults wouldn’t stick with some pitiful system without good reason) and plenty of education experts had been saying the same things. Adults seem perfectly fine not adopting proven better education practices just as they are fine not adopting proven better management practices. When Dr. Deming was asked what to do instead of performance appraisal, when he railed against performance appraisal, he said do “whatever Peter Scholtes says.” To the question of what we should we do about the education system I say do whatever David Langford and Alife Kohn say. I know more about the specifics of what educational systems following David Langford’s idea are like, and all I can say is they are wonderful. If I had kids I would definitely consider moving somewhere that had such a system (like Leander, Texas where they have been moving down that path for 20 years). They focus on helping student learn in a way that is so much more sensible than the one I had to sit through and most everyone reading this had to sit through. The percentage of students that graduate with a desire to keep learning from an educational system like Leander is much greater than the traditional path. My high school had more National merit scholars than any public high school in the USA the year I graduated (some prep schools beat us, but only a few – partially because we were so large and they are often small). We had many students that were smart, dedicated and capable of succeeding at prestigious universities. Of course with tons of University of Wisconsin faculty as parents this is not a very surprising result. This entry was posted in Education, Public Sector and tagged ASQ Influential Voices, Education, learning, USA on June 8, 2014 by John Hunter. NASA did some amazing things culminating with landing on Moon. Much of what they did was doing many small things very well. They used 5s, checklists, gemba thinking, usability, simplicity, testing out on a small scale and much more. Here are a few photos from the Smithsonian Air and Space museum in Washington DC. I also have some nicer NASA 5s photos from the new Annex near Dulles Airport, but, ironically, I can’t find them. 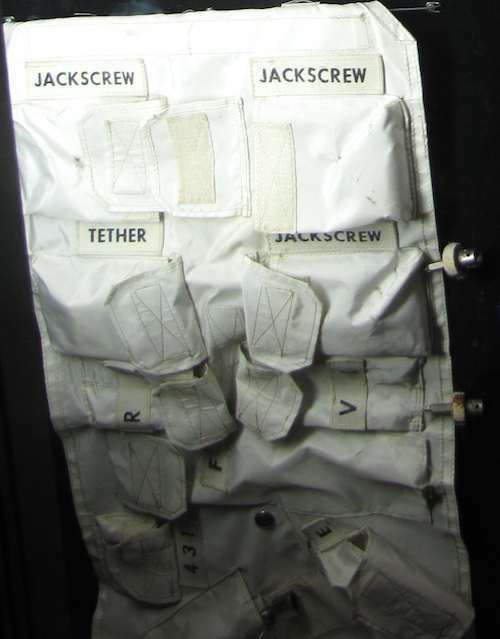 These kits were used by NASA astronauts on the Apollo 11 mission to the moon. Obviously NASA had to have everything that might be needed where it was needed (picking up something from the supply closet in building 2 wasn’t an option). This entry was posted in Deming, Lean thinking, Quality tools, Systems thinking and tagged government, lean manufacturing, Process improvement, Quality tools, USA, usability on September 11, 2012 by John Hunter. 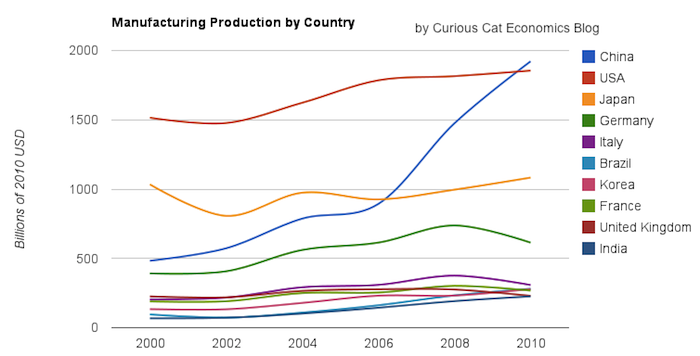 Chart of manufacturing production by the top 10 manufacturing countries (2000 to 2010). The chart was created by the Curious Cat Economics Blog. You may use the chart with attribution. All data is shown in 2010 USD (United States Dollar). Over the years I have been posting data on the manufacturing output of leading countries. In 2010 China finally overtook the USA to becoming the leading manufacturer (long after you would have thought listening to many news sources and political leaders). 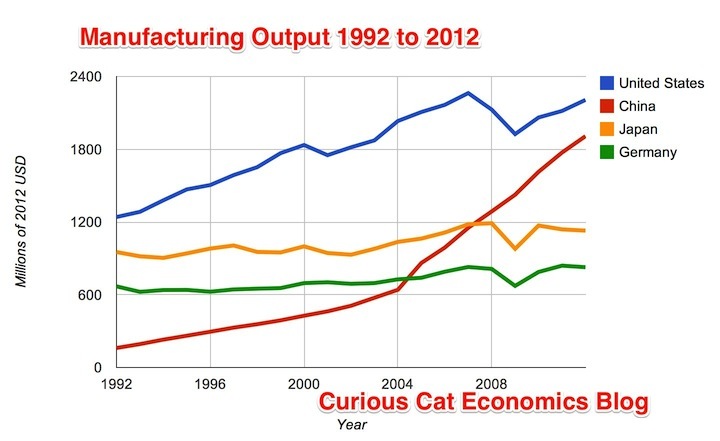 In a previous post on the Curious Cat Economics Blog I looked at the output of the top 10 manufacturing countries with a focus on 1980 to 2010. In 1995 the USA was actually very close to losing the lead to Japan (though you wouldn’t think it looking at the recent data). I believe China will be different, I believe China is going to build on their lead. There has been some talk for several years of manufacturing moving out of China seeking lower cost countries. The data doesn’t support any decline in Chinese manufacturing (or significant moves away from China toward other South-East Asian countries). Indonesia has grown quickly (and is the largest SE Asian manufacturing country), but their total manufacturing output is less than China grew by per year for the last 5 years. This entry was posted in China, Manufacturing and tagged China, curiouscat, economic data, economy, Germany, India, Japan, Manufacturing, UK, USA on August 13, 2012 by John Hunter. Total health expenditures in the USA in 2010 reached $2.6 trillion, $8,402 per person or 17.9% percent of GDP. All these are all time highs. Every year, for decades, health care costs have taken a larger and larger portion of the economic value created in the USA. In 2009 the USA Spent Record $2.5 Trillion, $8,086 per person 17.6% of GDP on Medical Care. USA health care spending grew 3.9% in 2010 following an increase of 3.8% in 2009. While those are the two slowest rates of growth in the 51 year history of the National Health Expenditure Accounts, they still outpaced both inflation and GDP growth. So yet again the health system expenses are taking a bigger portion of overall spending. This has been going on so long that the USA spends double what many other rich countries do on healthcare with no better results. As a result of failing to address this issue for decades the problem is huge and will likely take decades to bring back just to a level where the burden on those in the USA, due to their broken health care system, is equal to the burden of other rich countries. Over 2 decades ago the failure in the health care system reached epidemic proportions but little has been done to deal with the systemic failures. Dr. Deming pointed to excessive health care cost, back then, as one of 7 deadly diseases facing American business. The fact that every year costs have increased more than GDP growth and outcome measures are no better than other rich countries shows the performance has been very poor. The disease is doing even more harm today. Some good things have been done over the years, most notably by Don Berwick while at the Institute for Healthcare Improvement. He was effectively thrown out of office by the politicians recently. The same politicians that have through decades of such foolish acts contributed more than any other group to the broken health care system that burdens the USA today. In the last 10 years a significant amount of good work has also been done in “lean healthcare”: applying lean thinking to healthcare. But it is similar to the quote that a “bad system will beat a good person.” With all the bad systemic issues the efforts, good as they are, in lean healthcare are mainly improving around the edges. Of course, “around the edges” of a $2.6 Trillion dollar system can still be extremely valuable and important. This entry was posted in Economics, Health care, Systems thinking and tagged business, economic data, Economics, economy, Health care, health care system, USA on January 19, 2012 by John Hunter. Manufacturing in the USA continues to do well. But it could do better. There are reasons manufacturing that could be located in the USA is not. And addressing those can increase USA manufacturing. Some reasons are sensible, based on the existing economics and realities of comparative advantage. Some reasons are just flawed thinking, such as the “spreadsheet management” taught at many business schools that Deming and lean thinkers can understand the flawed thinking that leads to outsourcing. Typical wall street thinking (also driven by “spreadsheet management think” rather than an actual understanding of value stream of a potential investment) also hampers raising investment capital for USA manufacturing. The broken USA health care system also is a big problem driving up costs of doing business in the USA enormously. Safer and longer-lasting than conventional lithium-ion car batteries, the 52-year old MIT professor’s invention packs 600 cells into a case the size of an airplane carry-on bag. His technology has transformed the batteries used in many cordless power tools. So why are Chiang and his company, A123 Systems, having trouble moving to full-scale commercial production and creating thousands of new American jobs with his better mousetrap? Despite the promise of Chiang’s batteries, many on Wall Street and in Silicon Valley were incredulous when he and other leaders at A123 asked for capital to build factories in America — Asia, yes, but Michigan, why would you want to? Even more daunting, nearly all of the world’s battery manufacturing industry is in Asia, where plants can be built faster and supplies and equipment are much easier to get than in the United States. These days, it’s hard to find Americans who even know how to build a battery factory. That’s why A123 had to give in and build its first plants in China, where the company could move into production quickly to show auto industry customers that it could deliver on future contracts. Despite the obstacles, A123 and a few other advanced battery producers are building plants in Michigan and other states, thanks to massive government support that has offset Wall Street’s skepticism and should help domestic producers narrow cost disadvantages with Asian rivals. A123 is getting $250 million in aid from the Obama administration’s stimulus program as well as tax incentives from Michigan. Its first U.S. plant opens in June in an abandoned brick building near Detroit that once made VHS tapes for Disney. A123 has five plants in China, coincidentally located in Chiang’s father’s hometown of Changzhou, about two hours’ drive west of Shanghai. Bart Riley, an A123 co-founder and chief technology officer, figured it took about nine months to get a Chinese factory up and running, one-third the time typical for the U.S. The quicker launch helped A123 make a name for itself through Black & Decker, which in early 2006 began putting A123 batteries in its DeWalt power tools. Since then, A123 has been supplying batteries and battery systems for New York City buses built by Daimler, among other customers, and the company has agreements to develop products for Chrysler, Navistar and American green-car maker Fisker Automotive. By the end of next year, A123 expects to have two plants in Michigan employing 400 people, with plans to go up to 2,000 workers able to produce about 30,000 battery systems a year. The company’s sales reached $91 million last year, and it has about 1,700 employees, two-thirds in Asia. The success of science and engineering university based research is still a huge advantage to the USA. Though other countries have seen the value in this and have invested in building their own capacity. The economic value of such is increased many fold by manufacturing the innovations created in your country. This entry was posted in Economics, Manufacturing and tagged China, Economics, Manufacturing, USA on May 9, 2010 by John Hunter. Singapore is again ranked first for Ease of Doing Business by the World Bank. For some reason they call the report issued in any given year as the report for the next year (which makes no sense to me). The data shown below is for the year they released the report. The rankings include ranking of various aspects of running a business. Some rankings for 2008: Dealing with Construction Permits (Singapore and New Zealand 2nd, USA 26th, China 176th), Employing Workers (Singapore and the USA 1st, Germany 142nd), protecting investors (New Zealand 1st, Singapore 2nd, Hong Kong 3rd, Malaysia 4th, USA 5th), enforcing contracts (Singapore 1st, Hong Kong 2nd, USA 6th, China 18th), getting credit (Malaysia 1st; UK and Hong Kong 2nd; Singapore, New Zealand and USA 5th), paying taxes (Hong Kong 3rd, USA 46th, Japan 112th, China 132nd). These rankings are not the final word on exactly where each country truly ranks but they do provide a interesting view. With this type of data there is plenty of room for judgment and issues with the data. Several of my posts, from my other blogs, that I recommend on this topic: The Future is Engineering, Science and Engineering in Global Economics and Intellectual Property Rights and Innovation. This entry was posted in Competition, Economics, Management and tagged Data, Economics, entrepreneur, global, Japan, UK, USA on November 8, 2008 by John Hunter. See manufacturing data for more countries. The USA’s share of the manufacturing output of the countries that manufactured over $200 billion in 2007 (the 12 countries on the top of the chart above) in 1990 was 28%, 1995 28%, 2000 33%, 2005 30%, 2006 28%, 2007 27%. China’s share has grown from 4% in 1990, 1995 7%, 2000 11%, 2005 13%, 2006 15%, 2007 16%. Total manufacturing output in the USA was up 76% in 2007 from the 1990 level. Japan, the second largest manufacturer in 1990, and third today, has increased output 15% (the lowest of the top 12, France is next lowest at 32%) while China is up an amazing 673% (Korea is next at an increase of 271%). This entry was posted in Data, Economics, India, Manufacturing, quote and tagged Asia, China, curiouscat, economic data, Europe, Germany, India, Japan, Manufacturing, UK, USA on October 30, 2008 by John Hunter.